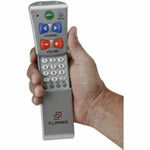 Flipper Remote - Large Buttons Make This TV Remote Control Easy To Use for Seniors and the Rest of Us! This is a great TV remote control because it is so easy to use. The Flipper Remote® is good to have especially if you have young children or old folks eh have sicknesses like alzheimmers. You will eliminate problems of reprogramming and this can be quite a nuisance at times. With the large buttons, it makes watching TV quite easy for anyone. The Flipper Remote is designed to work with cable, satellite, televisions, digital converters or set up boxes. It has an code locking, that will prevent others from reprogramming the set �up that is in place. The set up buttons are hidden in a sliding case that puts them out of reach. It allows you to set up thirty of your TV channels on one button and this is great for kids and seniors alike..By this way you will eliminate the needs for menus and guides. Another thing nice about the Flipper Remote is its sleek and easy to use design. It�s an excellent way to operating your TV and it is more enjoyable than the standard remote control because everything become easier and less worrisome. Use the links below to find the best offer of the Flipper Remote®.